In this article you will learn two powerful song writing exercises that will allow you to slip easily into your "flow state". This is the most creative state to be in, and when you reach this state, creating amazing song ideas will become easy. This exercise will allow you to get in the brain wave state that will open you up to using your creative resources that exist in the normally offline, unconscious regions of your mind and body. As discussed earlier, it’s been observed that creative behavior is closely linked with the production of Theta and delta brain waves. This means that to enter your song writing “flow state”, you need to encourage your brain to begin producing these brain waves. You may remember that the theta and delta brain waves normally occur when you are asleep, but it is possible to begin creating these brain waves by entering into a deep state of relaxation. When you do this you will be in a state of increased creativity, and also a state where self two can effortlessly “take over”. Sitting in a comfortable chair, close your eyes. Breath deeply letting stress flow out of your body with each breath, and peace and tranquility flow in. Each time you breathe out, say the word “relax” to yourself in a soothing voice. Continue to breathe in, and try and make each breath more rewarding and pleasurable than the last. As you do this exercise you will find yourself entering into a profound state of relaxation. This exercise is gently encouraging your brain to begin producing slower brain waves, and bringing into this “flow state” where you are in touch with your creative resources. When you find yourself extremely relaxed, you are ready to begin Free Playing . You have naturally coaxed yourself into your “flow state” and from here you can simply follow the Free Playing procedure from this profound state of relaxation. This exercise will help you to “surrender” yourself to self two once you have begun Free Playing or some other form of song writing. Or anything else, then this technique will help you to get self one out of the way so self two can take over. This exercise is about what we discussed a little earlier in the “Unleashing Self Two” article. Unfortunately it can be hard to actually “switch” self one off completely, so instead you need a different approach. You need to direct your attention away from self one. When you do this, you will free up self two to do it’s thing, which is exactly what you want! To do this, you can deliberately refocus your attention. You can listen to the music that you’re playing. Really hone in on it so your not focusing on the self talk that is interfering. You can also focus your attention on the way your body feels. Pay special attention to the physical sensations of playing your instrument. Or focus on the feelings of emotion that run through your body. The final thing you can choose to focus on is a visual cue. This can mean anything from watching your fingers play your instrument, to focusing on an object in the room. You can choose any of these three ways to re-focus your attention so self one becomes powerless, allowing self two to take over. I encourage you to experiment with different areas of focus, and see what works best for you. Be creative and choose different ways to focus your attention each time you create. If something works particularly well, use that method again. Remember that as long as you are being swamped by self one and it’s annoying little comments, you will never create your best song ideas. Use this technique to get past this… surrender to self two, your master songwriter… and enjoy the wonderful ideas that flow forth! This brings us to the end of this series. I hope you’ve enjoyed learning about some of these higher level song writing principals, methods and strategies that I’ve shared with you. As you can imagine, there’s a lot more, in fact, the information you’ve learned in this series is just the beginning. 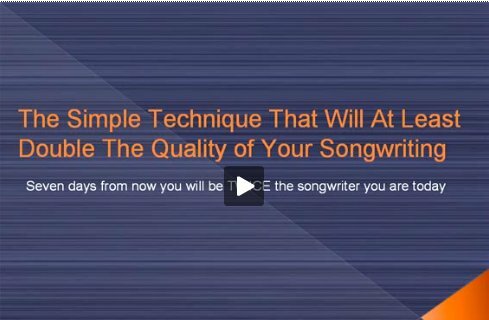 There are many more techniques, and strategies, as well as some crucial higher level principles that will allow you to achieve incredible results with your song writing. I hope you’ll investigate my book where I’ll take you through these things step-by-step, as well as give you some of the tasty stuff, the little tips and tweaks that will take your songwriting to the next level.